Arenal Volcano National Park is a northern Costa Rican must see, a massive expanse of land (29,692-acre) that holds iconic hot springs, an active volcano, and extremely diverse wildlife populations. 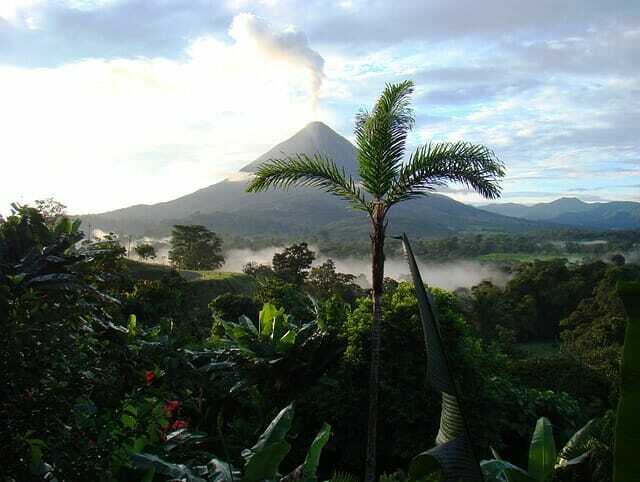 Located near La Fortuna within the Alajuela Province, Arenal Volcano National Park, while impressively huge on its own, is actually a part of a much larger Arenal Conservation Area. This area holds over 16 different reserves totaling 504,094 acres in all. The geographical and biological complexity within these areas is simply astounding. Arenal Volcano itself stands at 5,357 feet tall, considered to be the most active volcano in the country today. Arenal has seen a steady lava flow since 1968, whereas the volcanos neighbor, Chato Volcano, has been inactive for 3,500 years, today a serene lagoon area. While here your group can explore the Las Coladas Trail, taking you through the winding forest and through the cooled lava fields. Pass the aforementioned crater of the dormant Cerro Chato Volcano or head to gorgeous Lake Arenal to see the spot where 12% of Costa Rica’s hydroelectric energy comes from. This spot is also adjacent to working wind farms and the Miravalles Volcano Geothermal Plants. Taking a closer look at either of these locations will show you glimpses of local wildlife, with animals such as deer, tapir, snakes, parrots, magpies, howler monkeys, and white faced monkeys often making appearances. As far as the local flora goes, prepare to be immersed into a lush world of palms, bromeliads, mosses, and guayabo de monte!